Something a week | It's just like a mini-mall. I use public transit a bunch, here in Seattle. It’s great, and since I work at the University of Washington, I get my pass at a discount. So, basically, I’m always on the light rail. I’ve noticed, however, a frustrating lack of signage. At least once a day, I’ll need to help someone find their way, or tell them which way is North, or how to use the card scanner. 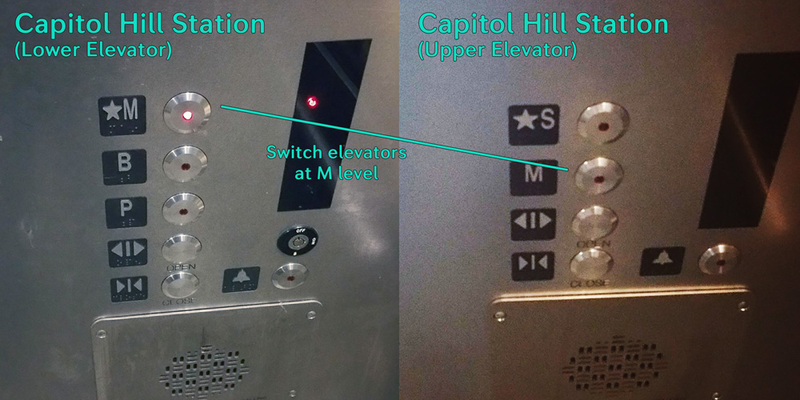 But, the thing that consistently confuses the most people, is the elevator buttons at the UW station. Easy enough. The Mount Baker Station’s train is elevated; the Beacon Hill train is underground. Plaza, Train. It’s not perfect. There aren’t any pictures, for people who don’t read (or don’t read English), but there are only two buttons, and they’re labelled. Good enough. OK, so what’s going on here? No more words, only letters. The only letter I see from before is P, so that must be the Plaza, so is S the train? Nope. S is “Street.” M is “Mezzanine,” because this part of the station has two offset levels, and you switch elevators between them (That’s not a complaint, really. Sometimes that’s the only way.). What’s that you say? “P almost always means ‘Parking,’ especially when it’s underground. And anyway, you already used it for ‘Plaza.’ and nobody uses the term ‘Platform.'”? Consistency would help. Words would help. And pictures would help immensely. 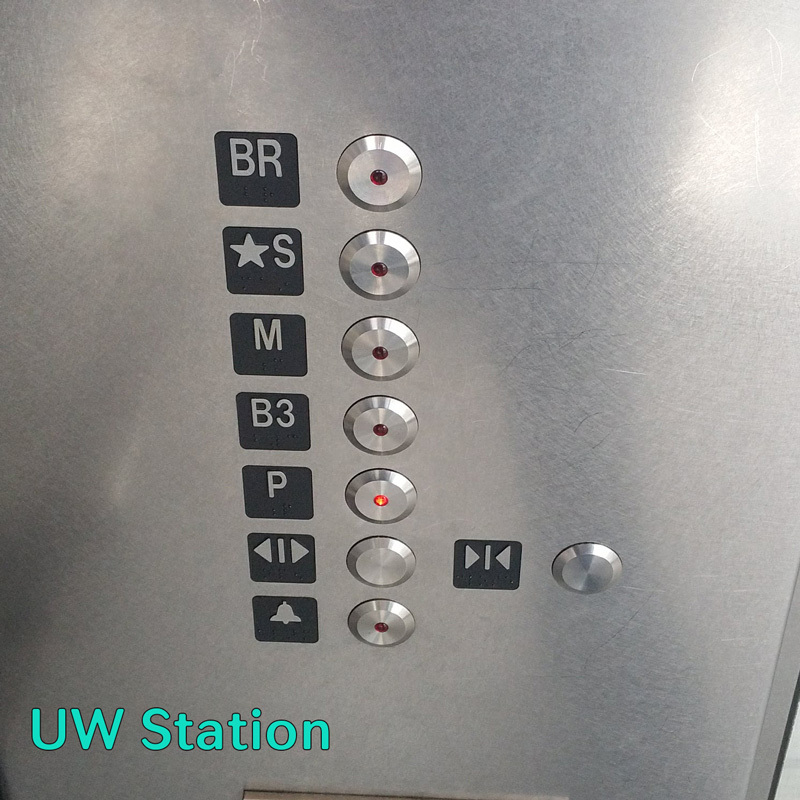 But again, only two buttons on the upper elevator, and not as many people use this one, so… You know, I was planning on ramping up the badness of the examples to reveal the UW elevator buttons, but this is really bad. Equally as bad as the next; maybe worse. I’ll probably deal with this in a bit, but I guess it doesn’t directly affect my life in as much of a way, so I didn’t do it this week. We’re cheating a bit, because I already told you that P is “Platform,” and S is “Street,” like in Capitol Hill. M is still “Mezzanine, but this level is inaccessible without a key or keycard. Maybe M is “Maintenance” at this station. Who knows? B3 is “Basement 3,” maybe? I have no idea, because there’s no Basement 2, even if I count the Mezzanine as Basement 1. Also inaccessible to the public. There are 2 elevators at the UW Station, and this one is the worst. 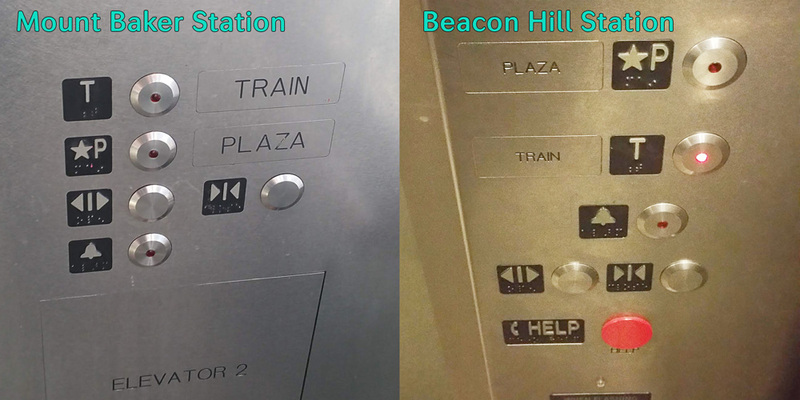 The other elevator omits B3 and M buttons, so it’s an easier choice, but 50/50 you’re getting on this one. What makes it worse is that there is very little signage indicating that the light rail station is underground, especially if you’re on the bridge. 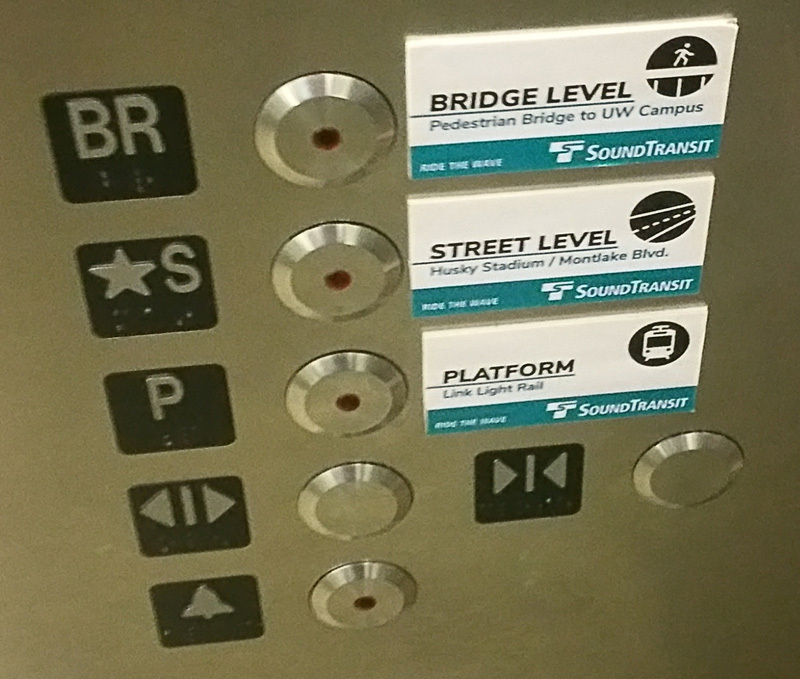 The scenario I see most frequently is: someone unfamiliar with the system will enter on the bridge level, think, “Uhhhhh…” and press S, because it has a star next to it. Then it will open on the street, and that person will get off, wander around, and eventually get back on the elevator. If nobody’s around again (or if someone is around, but being particularly unhelpful and only observing the confusion, like a scientist or jerk might do), they’ll think “Well, it’s not Parking,” and B3 is a terrifying option to even think about. So, they’ll mash M for “Maybe Train?” and the button light will come on and immediately turn back off. At which point, I usually help out. If they initially get in on the street level, they will often take the elevator up to the bridge, and be just as confused. I printed up some placards. They’ve got full names, descriptions, and most importantly (I think), pictures! 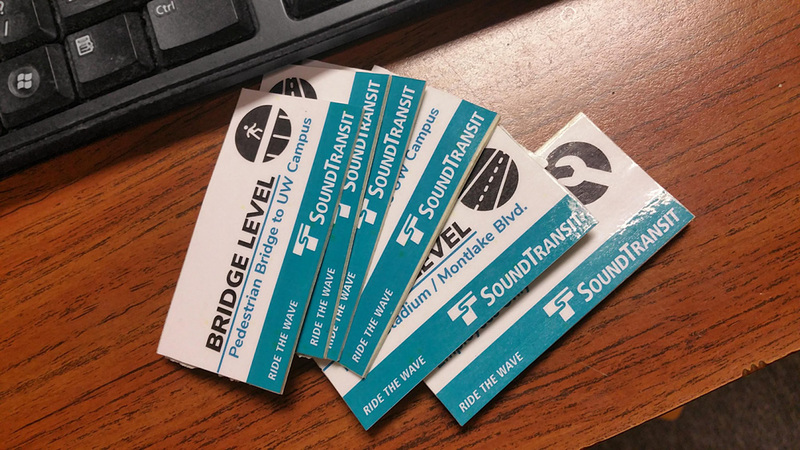 They also have Sound Transit logos on them, because I was banking on the idea that if they looked official, they might stay up. I didn’t make one for B3, because I don’t know what it is. And, it’s not important for the public to know. And also, I wasn’t looking at my photos when I made these, and forgot B3 was a button. Cut, laminated, mounted to some sturdy double-sided tape, and ready to go. Ta-dah! This is a picture of the other elevator at UW Station (the 3-button one). I put them up in both, but only got a picture of this one. I think it’s an improvement. I don’t have braille on mine, because I don’t-know/can’t-print braille, so it’s not perfect. But then again, I’m not a professional sign-maker. Please ignore the alignment issues. I was installing them within a time limit of about 15 seconds, and I messed it up. If someone would like to do it better, please do! You can do Capitol Hill while you’re at it. I didn’t make a comprehensive sweep of elevators, so I’m sure there are others that need help, too. By the way, the above picture is from a about a week after I put them up! They’re still up! We did it! Next up, maybe some signs that say, “Both trains go the same direction from this station” to put up at the end-of-the-line stations. That seems to confuse people to no end. …Or probably something to tell people to tap their ORCA pass card at the end of their ride, too. Yeah. Hey, Seattle! If you’re reading this, tap your ORCA card off at the end of your ride! It’s a switch! It works differently than the buses. Your ticket costs less if you ride it a shorter distance, but if you don’t tap off, you pay the maximum price! Also, if you don’t tap off, the next time you ride, your tap ON might register as a tap OFF from last time. Then you’re riding illegally, and you’ll get a fine. Not to mention the user data! If nobody taps off at your station, the data looks like nobody uses that station, so maybe it’s not as important for upkeep and funding. Come on, folks! 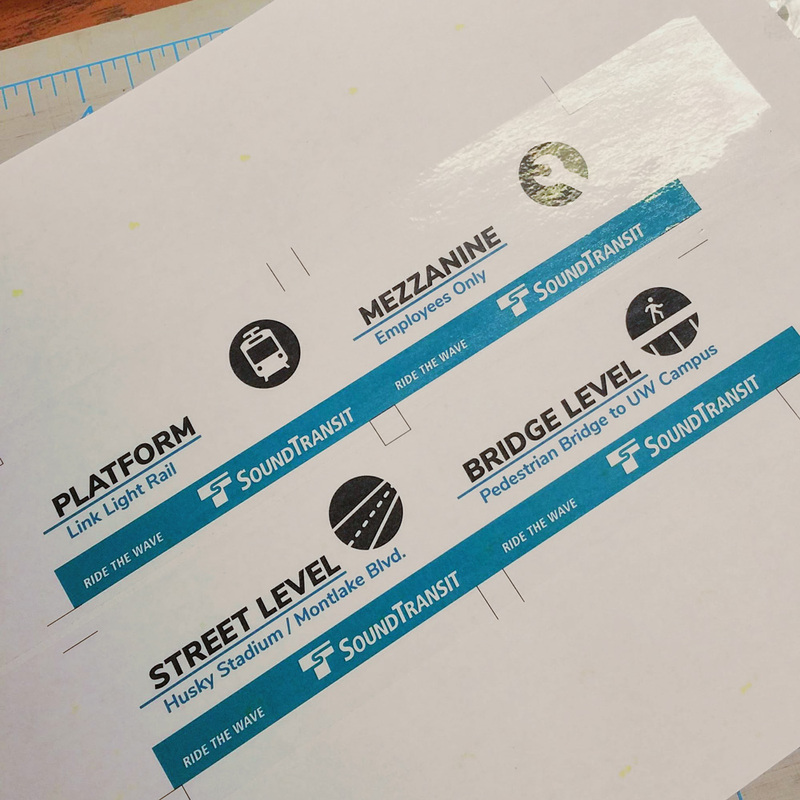 Also, Sound Transit: I do this out of love. A good friend will tell you when you’re doing something wrong. I love the light rail, and I hope you understand and we’re cool. This project happened a while ago, but I had some file storage problems and lost pretty much all of the process photos. So, I delayed posting for a while. I’ve finally come to terms with the fact that they’re gone forever, so this post is cobbled together from what I do have (…which are mostly finished product shots). I sent her a picture of an idea, and she sent some suggestions back. Then I got to work. The fabric showed up, and it was really, really nice. I just wanted to wrap myself up in it and go to sleep, but I resisted the urge. I tend to work with whatever is at hand. So, this fabric was a refreshing change from the usual bed sheets, cheap fleece, and thrift store sweaters. I really like the colors we decided on. It’s all done in a single color of fuchsia fabric with a matching, shade-lighter thread and a few accents in black thread. It looks sharp! The texture on those speakers took forever, just sewing (roughly) parallel lines, back and forth. A standard cassette tape will stay snugly lodged in the tape area–which is probably the best use for your high school mixtape. …Then it’s ironed and gets a top-stitch all the way around to crisp everything up, and attach the layer below. My top-stitching isn’t perfect, and that’s fine for a project where you’re emphasizing the hand-made aspect of it. Also, the padding is mostly latex foam, which is notoriously difficult to cut without a fancy hot-wire setup. I looked around for other cutting options and saw someone suggesting an electric turkey knife. So, I hit the clearance section of the local grocery store and found one for about $9. It was amazing! The electric turkey knife was so effortlessly fun to cut with, I went out and bought more latex foam for some other project in the future. I don’t even know what I’ll do with it, yet, but I can’t wait to cut more foam. Oh right, I nearly forgot. I clearly didn’t take those awesome pictures myself (except the drawings). Michelle knows real professionals, so the cool, clean product shots are by Nathaniel Willson Photography, and the beautiful portraits of Michelle and the boombox are by Zoe Rain Photography. And if you want to go check out my high-end sculpture in a nice gallery setting, stop by Michelle Dirkse Interior Design in Capitol Hill, Seattle, or–you know–click here. 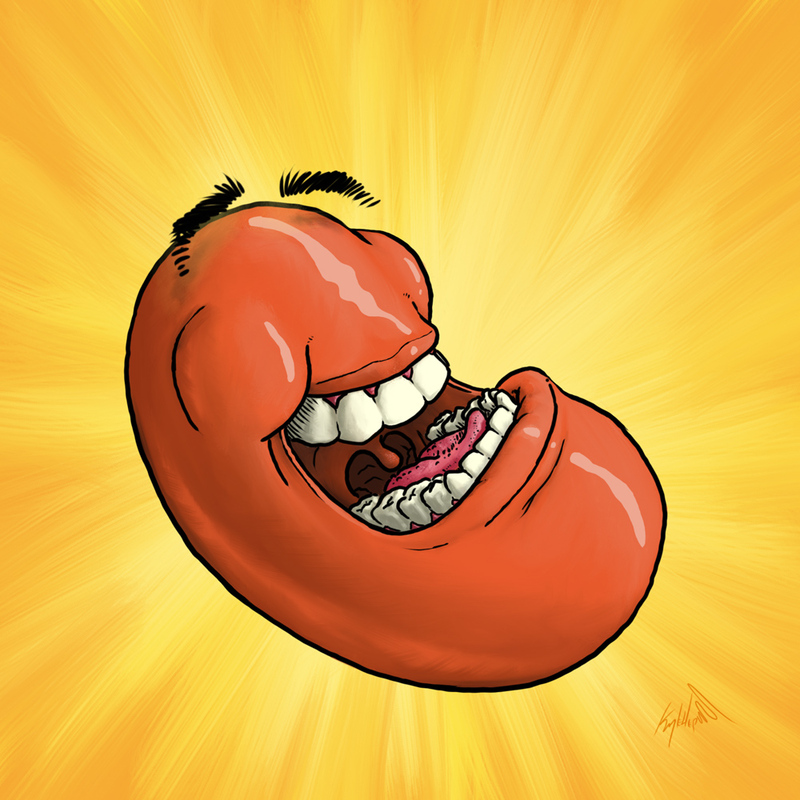 But the Cintiq is tethered to my desktop, so I can’t really draw on the go. They make very expensive Cintiq All-in-one tablets, that I lust over, and I’ve tried a bunch of pocket notebooks and pens, but for some things I actually prefer the feel of a stylus (which is weird in the art community, I know). So, I’ve had my eye on bigger format phones that use styluses for a while. I’m not the kind of guy who ever buys anything new. So, when Samsung came out with the Galaxy Note 5 recently, I was finally able to afford a Galaxy Note 4! I can’t stop. I love this thing! 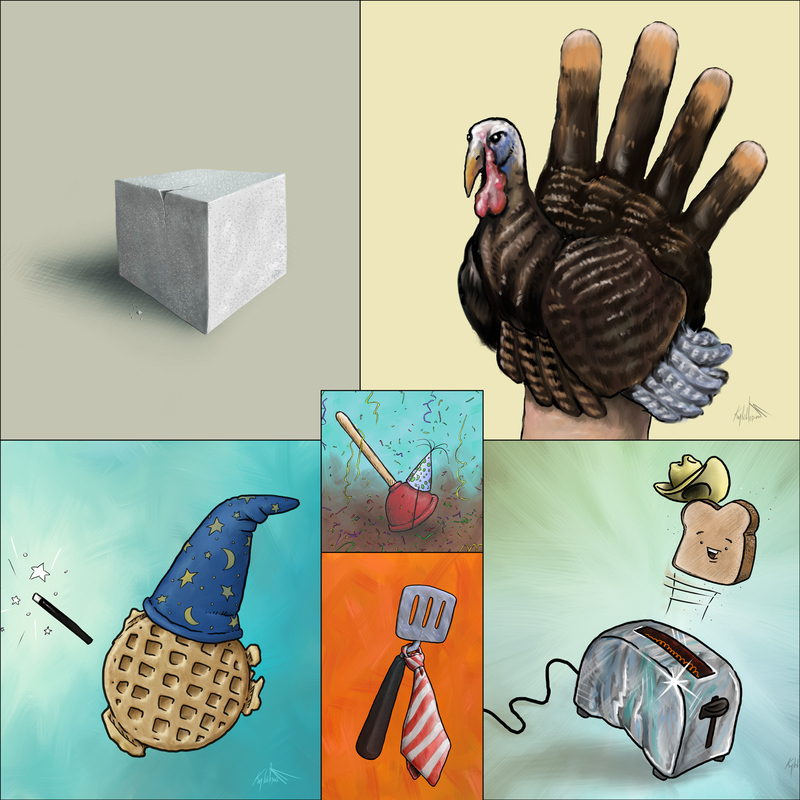 I’ve started up an Instagram account to post my dumb pictures (I use “dumb” in the most endearing way), so follow me there: @hepworthwhile Pretty much every drawing there is something I’ve drawn before, and most of them have appeared on this blog in some form. What can I say? 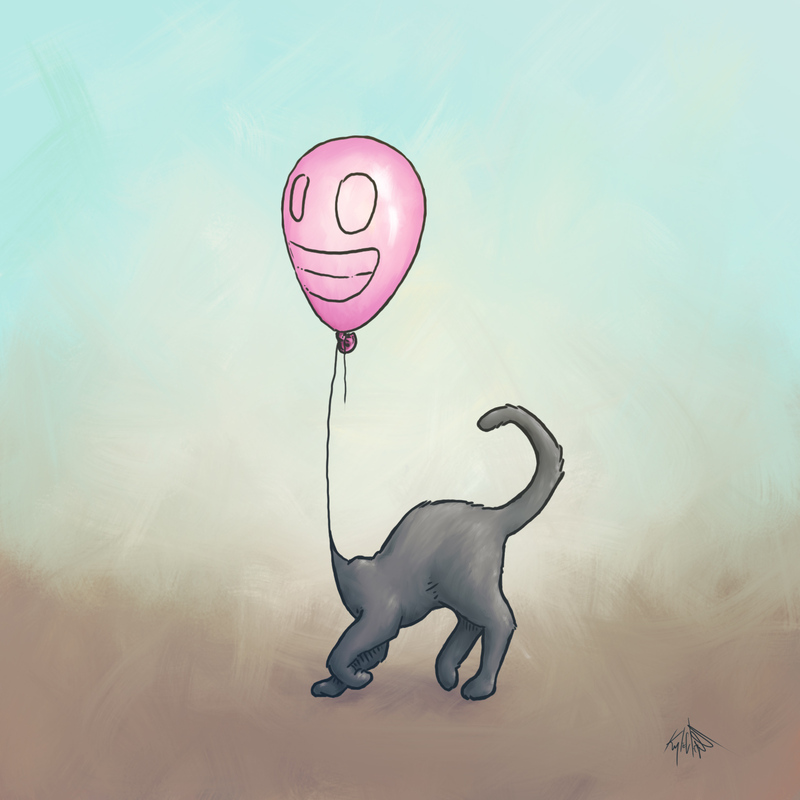 I like drawing the same things over and over. If Instagram isn’t your thing, worry not. I’ll probably post a few updates of my favorites here periodically. Happy Halloween! 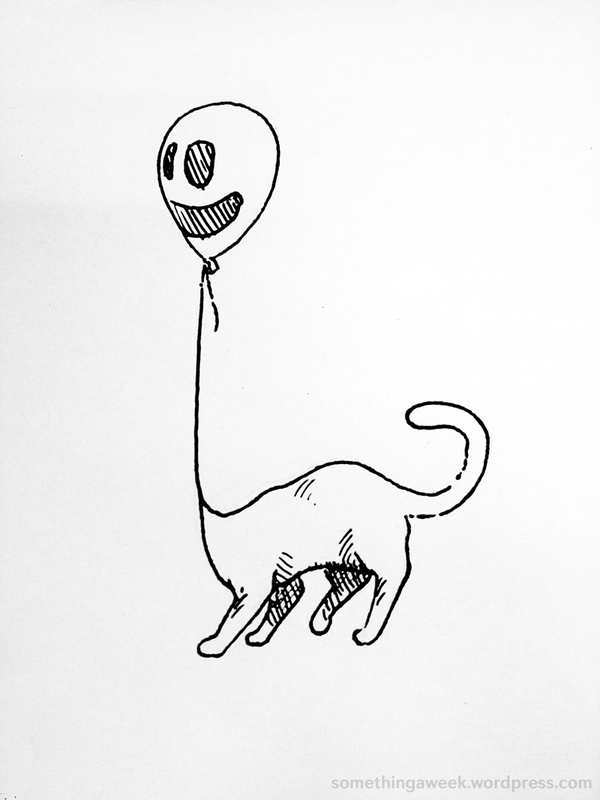 Here’s a monster I made. Megan mentioned we needed something to indicate we’re celebrating Halloween. Our door is kind of industrial and boring, and we were worried trick-or-treaters might not show up. And then I’d have to eat all this candy myself. So, I went to the garage and found a small gardening rake and a wooden box I had built for some project a long time ago. Never throw anything out, kids. After a few screws right through the plastic handle, I was happy with the way it stuck out. I wrapped it in some monster fur I had on hand (everybody has some monster fur laying around, right? ), and stuffed it a bit with some polyfil to disguise the handle. No sewing for this project, I just wrapped and hot glued. Boom! Monster arm! Complete with dirty fingernails! Thanks to a friend, I also have some enormous googly eyes lying around. The head is just some fur glued quickly in place, with some stuffing behind it to round it out. I did, at one point, put some angry eyebrows on him, because I thought he was too cute. But, the eyebrows made him genuinely a little too scary, so I took them off again. I ended up giving the arm a quick haircut to define the claws more, and to reveal more of the box frame. Trick or treat! Keen viewers might notice a different house. More on that later… probably. He is mysterious. He is unknowable. 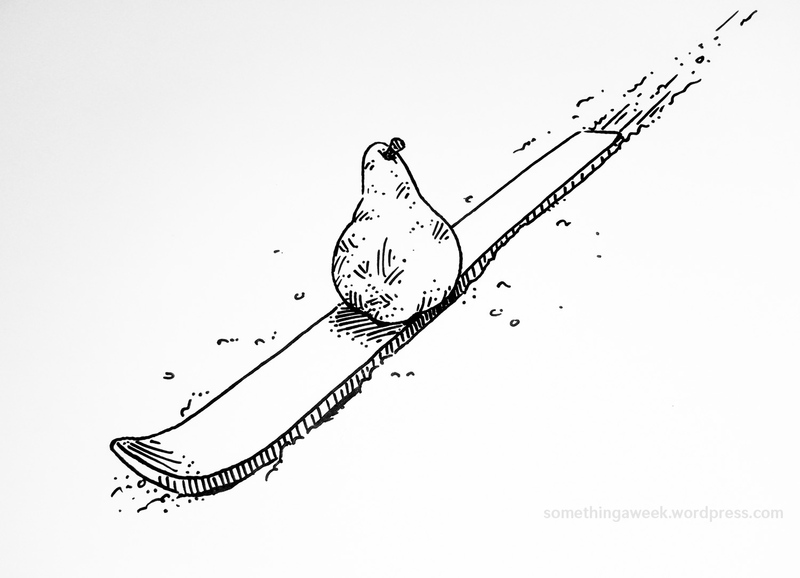 He is Ski Pear. Coming to Fox, Thursdays, this summer. 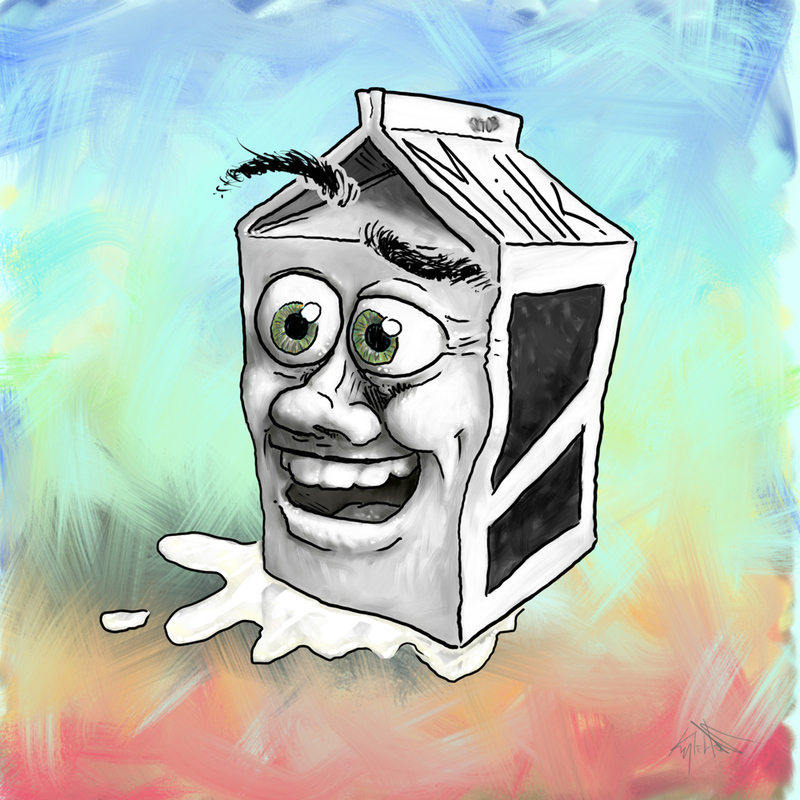 I made this, but I don’t know why.